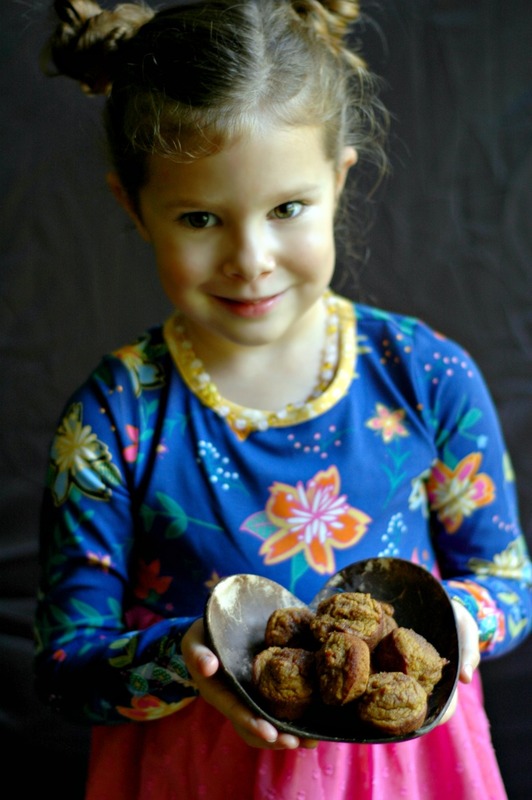 Gluten free mini pumpkin muffins made just right for little hands and big imaginations! Because why wouldn’t you want to bake in your best gown?! I invited the girls up to the counter, gowns and all, to help me make some pumpkin muffins. 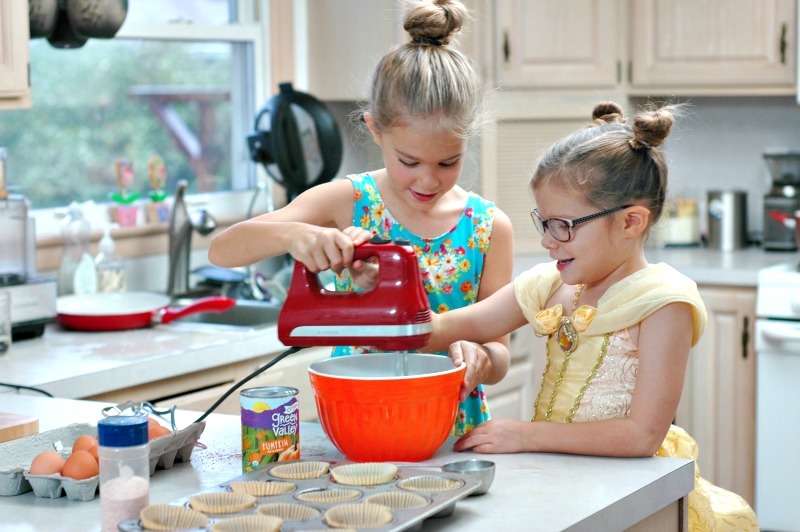 They were full captivated, and with each little giggle, egg crack, and sprinkle of cinnamon, I was convinced that baking in a princess gown is definitely something that everyone must try! As you can see in the above photos, my original plan was “regular” sized muffins. After a couple batches, I decided to make these muffins “mini” in honor of my mini-est little princess since she just adores muffins that fit right in her little hand. 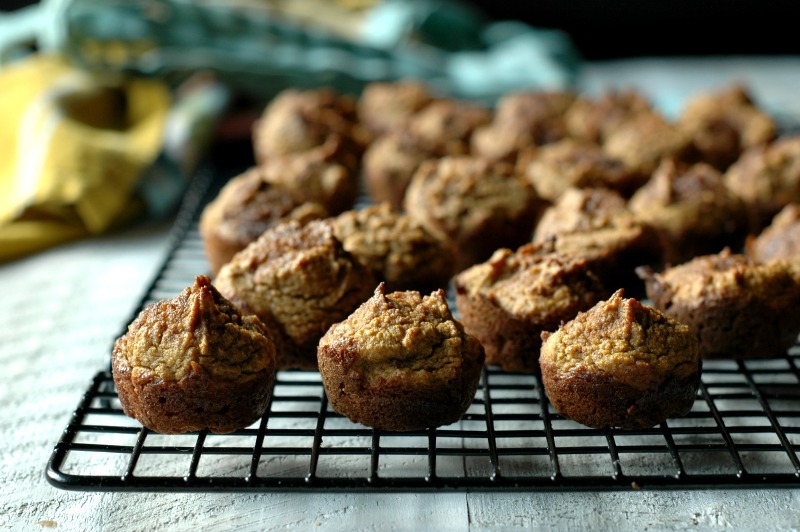 For those of you who have been around here long enough, you know that the girls love taking the Paleo Mini Banana Muffins to school – a lot! (See my hashtag #rgnschoollunch to see how we pack them!). 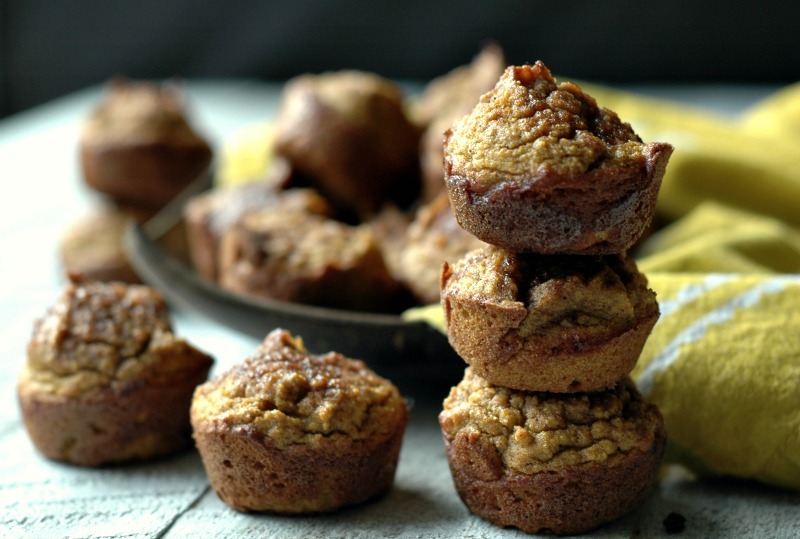 Since banana and pumpkin behave similarly in baking, I decided to use that framework for these muffins, and the results were simply delicious. A batter fit for a bowl or blender! I just LOVE that this batter can be blended up right in a blender or food processor. I pulled a bowl and hand mixer out for my littles when they were making their batch, mostly because it gave them more space to spread out – and what little one doesn’t love using a hand mixer!? But absolutely, dear momma, utilize your blender or food processor to whip that batter up super fast on a busy morning or prep day – it goes so fast. 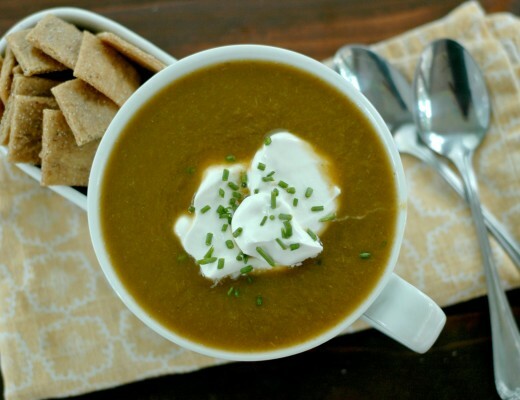 This recipe is simple enough for the littles to stick around from start to finish. 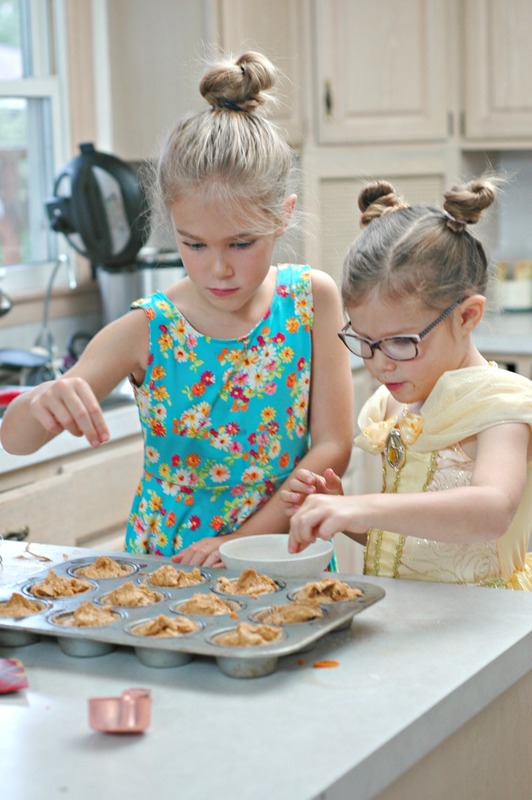 That feeling of making a recipe from the first egg crack to the last sprinkle is priceless – and these 2 were so excited to serve “their” muffins to their big sister for lunch when she got home! I’m even letting you go ahead and use that can of pumpkin to save on some time, unless you make your own pumpkin purees! For these muffins, the can definitely works. I also think that cinnamon suits little ones’ palates over the whole pumpkin pie spice deal (at least in my household that is the preference) – cinnamon is warm and sweet and makes the muffins really delicious – if you are a pumpkin pie spice fan, though, by all means use that! If you don’t have access to coconut sugar, raw honey or pure maple syrup are a fine substitute for the sweet. Coconut sugar has a lower glycemic index, and the warm sweetness goes really well with pumpkin which is why I love using it for this recipe. I have not tried other flour options for this recipe. With the right combination and ratios, this could be done with other gluten free flours though, I’m sure. They are already grain, gluten, nut, and dairy free so that covers a lot of bases! I am pretty convinced that every house with little kids ought have a large mini muffin sheet pan! I have gotten so much use out of this pan in the last couple years, and my only regret is not having it around when I walked through years and years of toddlerhood. I use this safe avocado oil spray to grease it down super fast and easy, though you can use mini muffin paper liners if you wish. 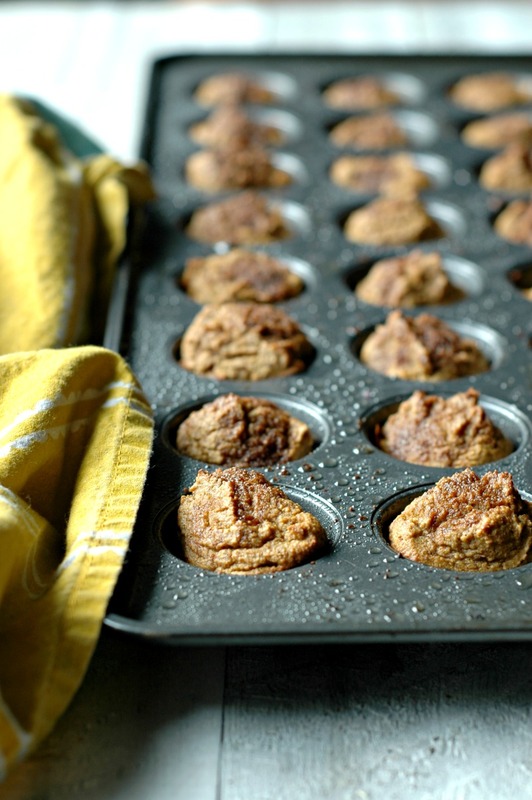 The mini pumpkin muffins freeze up fantastic. Simply let the muffins cool down all the way, and then pop them into a freezer bag. You can take them out to warm in the oven for breakfast, or pop them into lunchboxes completely frozen, and they will thaw by lunchtime. 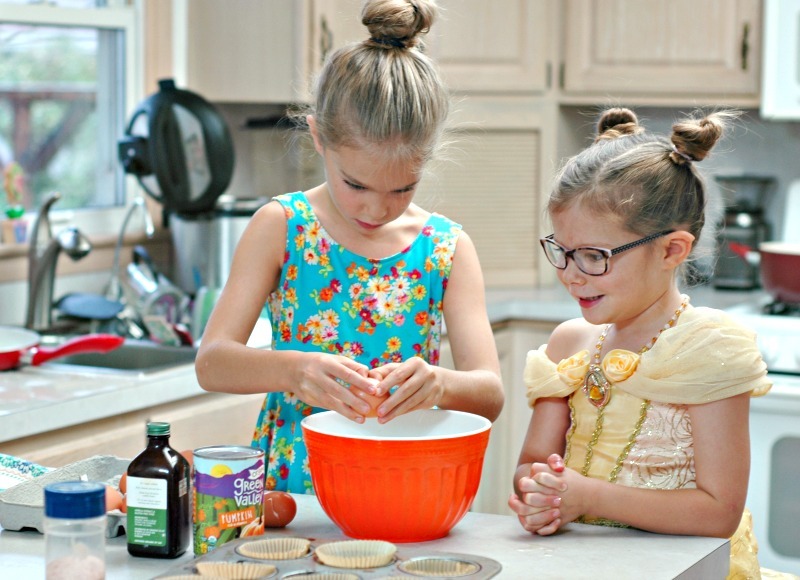 Gluten-free mini pumpkin muffins made just right for little hands and big imaginations! Pre-heat the oven to 375 degrees, and spray a mini muffin pan with avocado oil spray. 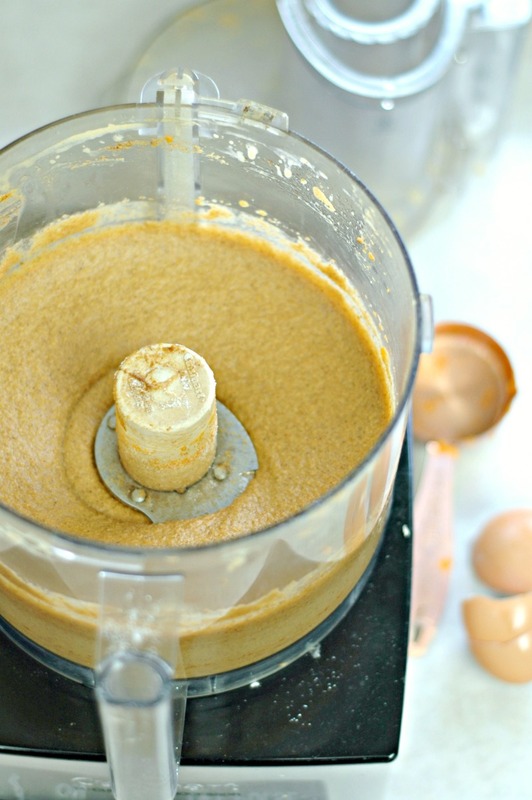 Put the eggs, pumpkin, oil, coconut sugar, and vanilla into your food processor or blender, and blend for 1 minute until smooth and creamy. Add the flours, cinnamon, baking soda, and salt and blend to combine until smooth. Scoop the batter into a mini muffin pan, and bake the mini muffins at 375 degrees for 13 minutes until golden brown and cooked through. Let the mini muffins cool for a couple minutes before turning them out onto a cooling rack. The muffins hold up really nice and are ready to eat in a just a few minutes of cooling! To freeze the muffins, let them cool completely and then toss them in a freezer bag to freeze. 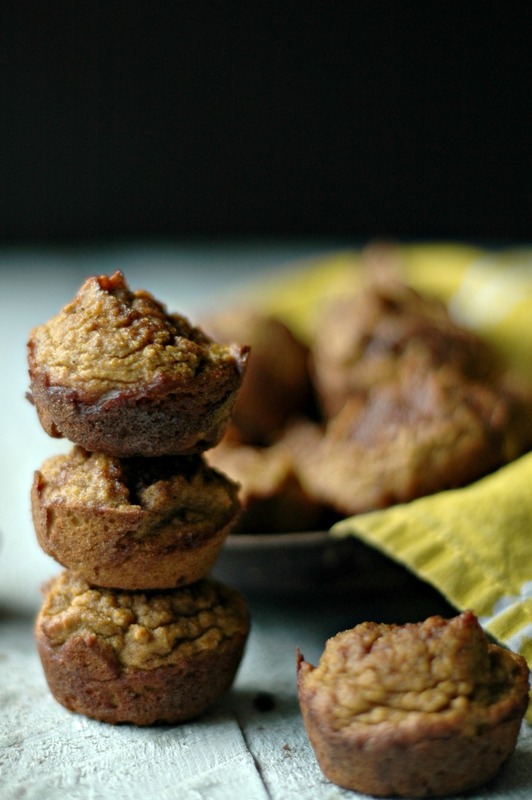 The banana version of these muffins has been my go to gluten free muffin recipe for a long time. I can’t wait to try this pumpkin version! 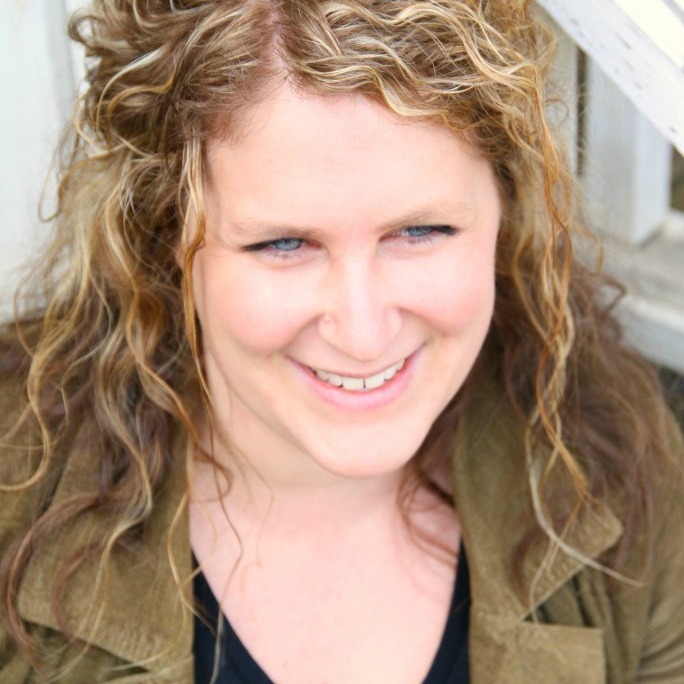 I love hearing that Hannah! I hope you enjoy these too! Such a cute story and beautiful memory! 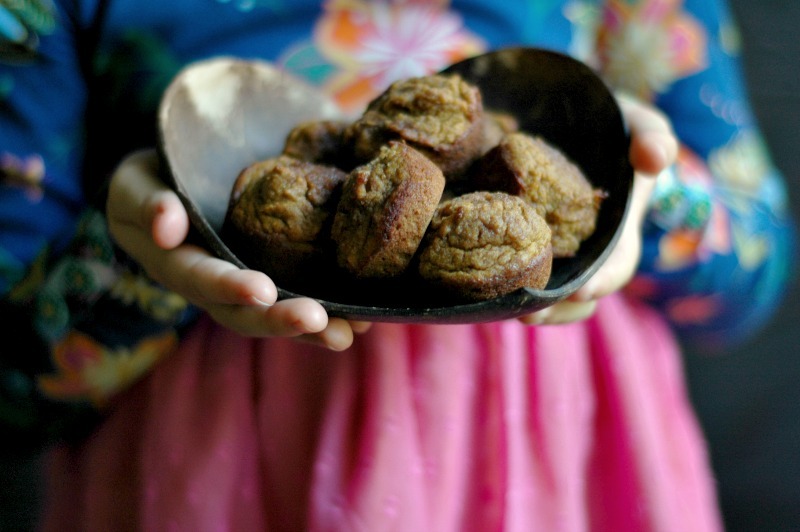 And pumpkin muffins are a win for me any time (whether they fit in my hand or not!). LOL Also, your youngest’s dress… I kinda want one for myself! Sweet story! Adorable pics too!! 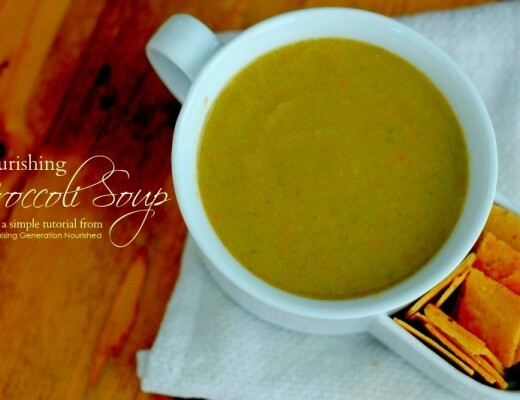 Love this recipe and have all the ingredients on hand.. May just need to make this today!!! Thanks. Cannot wait to try this. 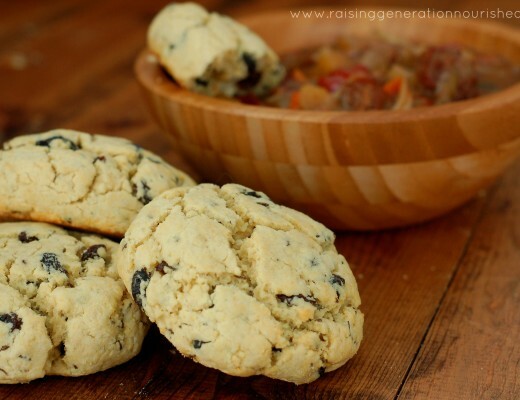 Another fabulous muffin recipe — can’t wait to try them with my dragons! Your princesses are utterly adorable and so at home in the kitchen! These look delicious! My daughter would love to wear a gown while making muffins. Basically her two favorite things! Oh gosh her face could make you melt, so dear! I love the story and her pretty princess dress – my youngest loved seeing the picture of her in her dress. These muffins are so special and perfect for this time of the year. These look so cute and delicious! Love that it’s all done in the food processor makes it so easy! Also, your kids are adorable! I think baking in a princess gown is the way to go! Thanks for reminding me how perfect the mini muffins are for children. I must pull my pan out for my grandchildren. I think they would really like this recipe, too! All these mini cupcakes look delicious. I’m definitely making them real soon. What a cute story! I don’t have a girls but I have baked with my boy wearing his costumes. Sweet way to make memories! 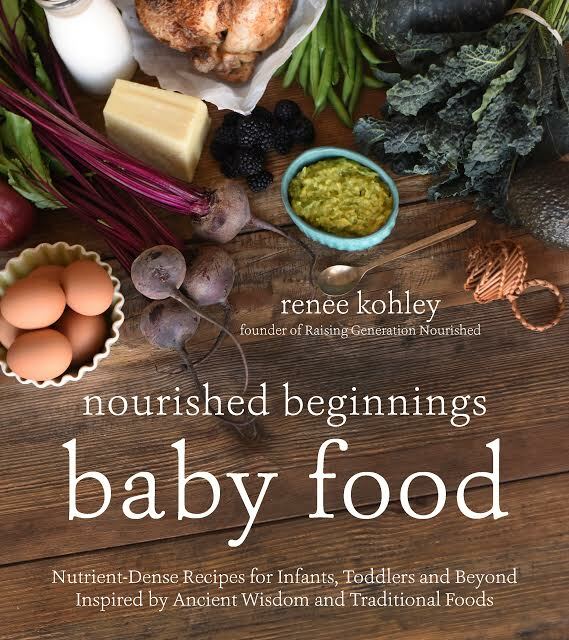 These look delicious and how precious your little ones! I would like to play princess too. 😉 I’ll have to try this recipe soon. I love mini sized muffins for snacking! My hands happen to be child-sized, lol. 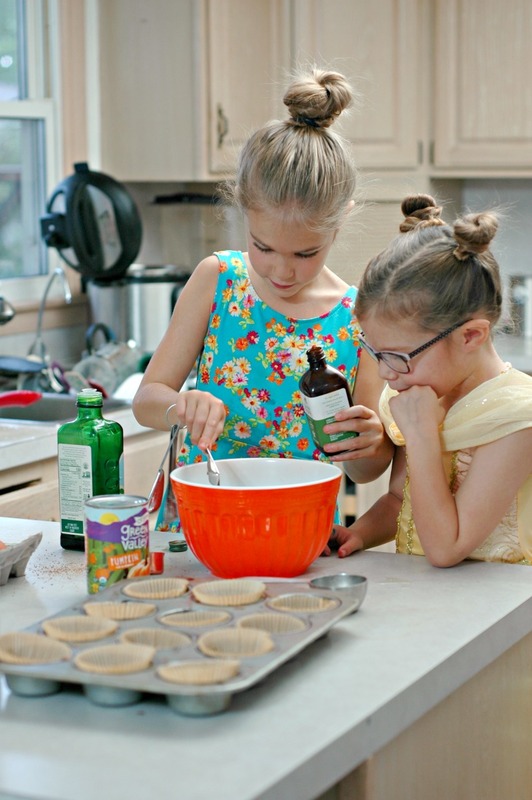 Your kiddos are so darn cute and skilled in the kitchen. A baking princess- I love it! Cute photos! 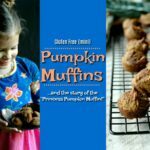 These muffins look so good for after school or perhaps and a little healthier choice for Halloween parties. These muffins look just perfect for kids! Great for Halloween! I love the photos – baking in that lovely gown – gorgeous! Little makes everything more fun in and i love all the clean ingredients! I’m always looking for new muffin recipes- yum! How cute are these! And I love how you get your kids involved in cooking. I wish I started early like them! Your baby girls are so adorable and i love that they spend time in the kitchen learning how to make healthy food with their mama. How lovely! Turrnrd out GREAT with cassava flour!!! Another great recipe!! 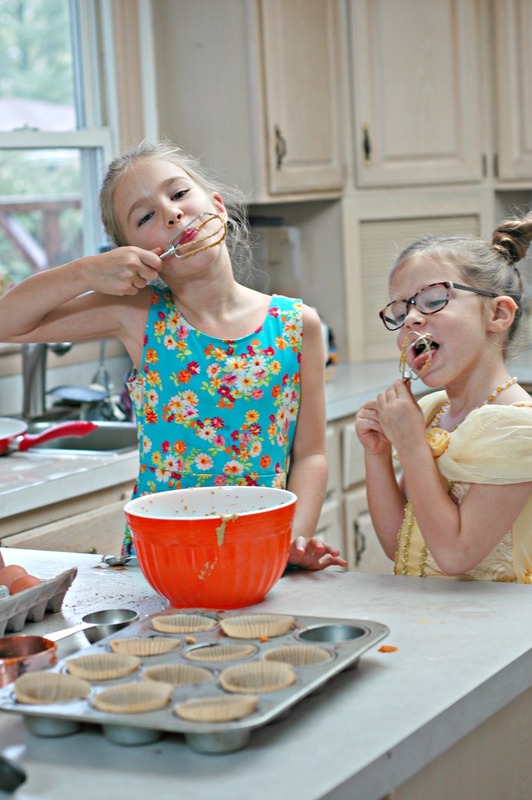 I love seeing your recipes with your girls in the kitchen, they look like they were having a blast dressed up and baking! Your girls are adorable! My daughter often find ways to recreate desserts I’ve made and tries to give them a royal name. Tgese muffins look delicious. Pinning to try later for sure! What cute story for your girls! The muffins look delicious. And I think the favorite part about having a baker for a mon (for my kids) is getting to lick the bowl! is there a different time for regular size ? and temp same? I’m still loving the pumpkin craze right now so these are perfect! I just made these (subbed different flour because I don’t have coconut), and they turned out great! I did 1 1/2× the recipe, used 1/2 cup almond flour, and 3/4 cups gf all purpose flour. Baked the same amount of time, and it made 46 mini muffins. Can’t wait for my kids to try them in the morning! I just made these this morning, and they were great. I was wondering if I would be able to switch the eggs with flaxseed eggs in the future. Is there a general guideline to follow when switching out eggs with flaxseed or chia seed eggs? Thanks! I love all of your recipes that I have tried. Hi Reba! 4 eggs is a lot to replace – I think with chia eggs I’ve found that anything from 1-2 eggs replaces ok – even 3 sometimes works. I’m not sure how replacing 4 eggs will go. What I’m thinking will happen, is that they will bind ok but eggs also provide rise to baked goods so they just might not puff up as much and might feel a bit denser. They will certainly hold together though.